The Tavern atop Mt. 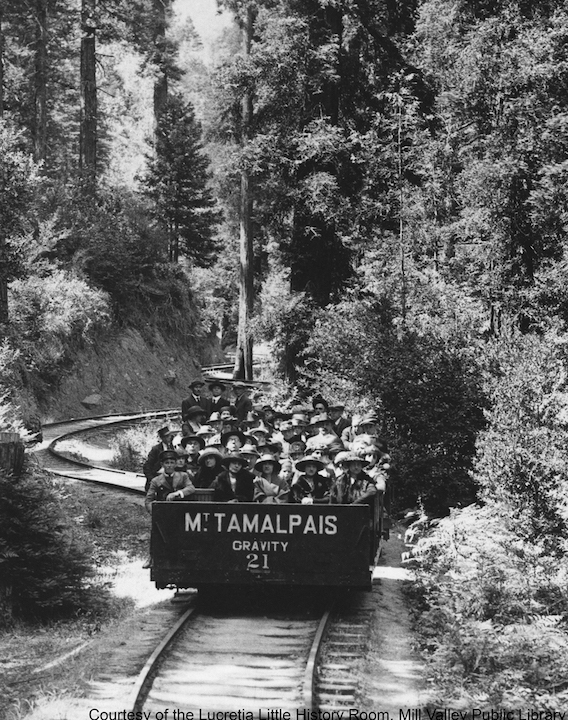 Tamalpais was part of the famed "Crookedest Railroad in the World" that climbed the mountain from Mill Valley on the southern edge. 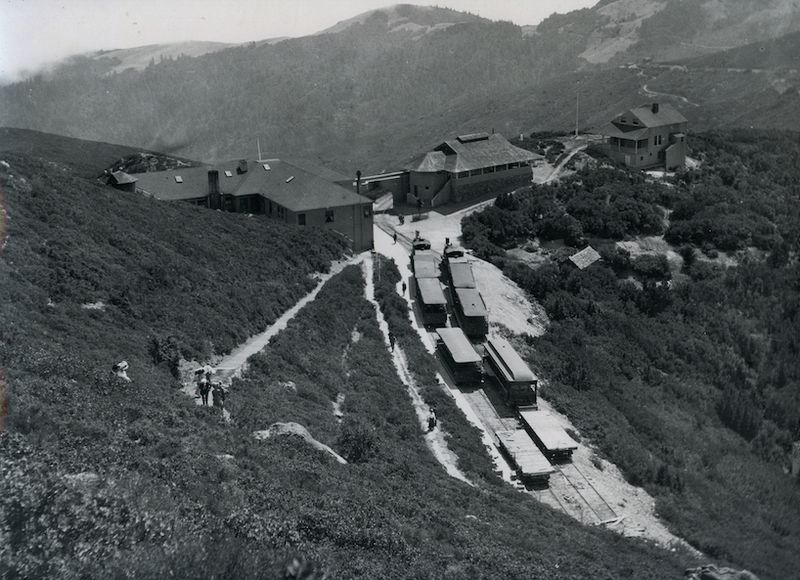 The business included not only scenic train rides to the top and back, but optional rides down in open-air "Gravity Cars" with a brakeman, ending in Muir Woods. 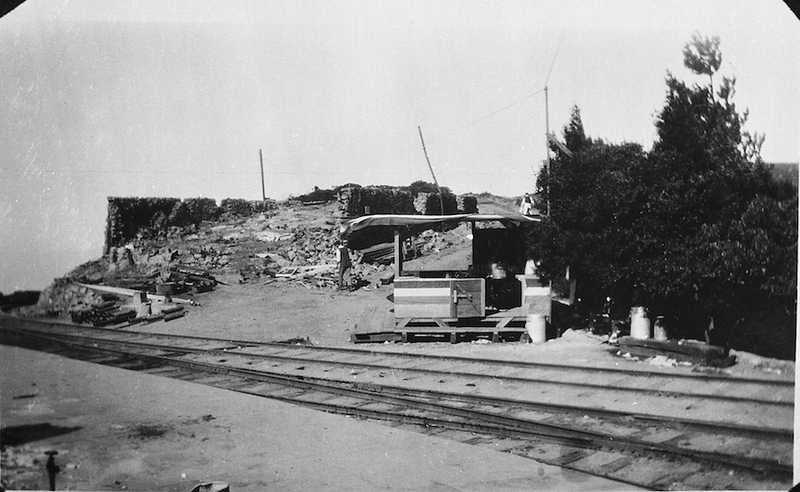 Opened in January of 1896, the tourist attraction closed in 1930 following the devastating wildfire of 1929, and at the start of the depression. Photo from Senior Captain Greg Jennings, Marin County FD retired: "I photo copied it in the 1970's from a family album belonging to Thelma Fenton, who actually took the photo on a hike to West Point the day it burned. She and her family lived in Mill Valley in the early years, and all of them were avid hikers on Mt Tam." Mount Tamalpais Tavern located on the summit of the mountain of the same name, known to tourists from all over the world as one of the principal sightseeing attractions of this section of California, burned to the ground tonight on a spectacular fire which is still burning in the brush of the mountainside where it started. 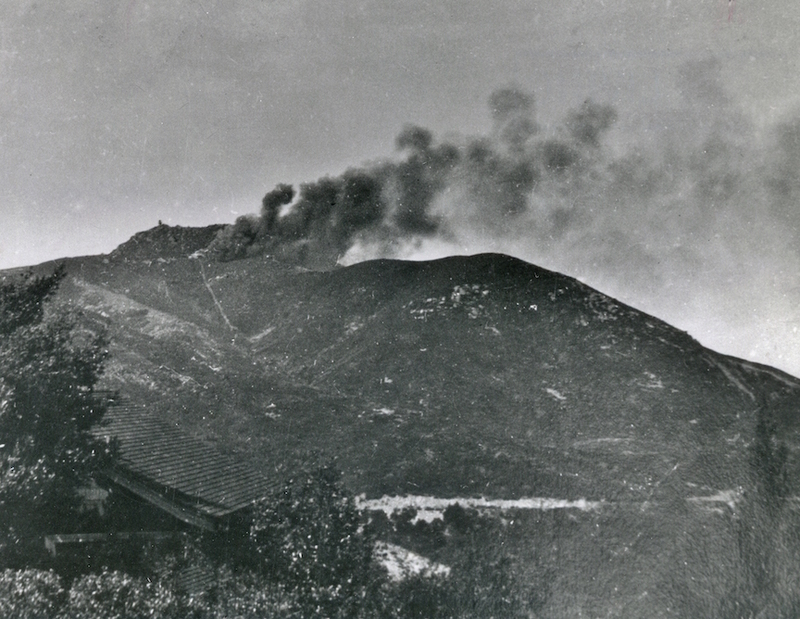 More than a hundred visitors on the top of the mountain, including fifty physicians and members of their families from all over the country here attending a convention, were brought down the mountain on a special train rushed to the top when the fire was reported. Hundreds of volunteers are endeavoring to control the grass and brush fire to prevent its sweeping down the mountain to Mill Valley and other summer home centers in Marin County. An investigation was started tonight by the fire warden of Marin County to determine the cause of the grass fire which ignited the hostelry. Belief was expressed that careless hikers may have dropped a match or left a smoldering campfire. Several trails lead up the mountain and it is the mecca for hundreds of hikers, especially Saturdays and Sundays. Guests were reported to have lost their baggage although in some cases they rushed into the smoke to secure their belongings. When the fire alarm was sounded aid was rushed from West Point Inn, two miles down the mountain but by the time the volunteer fire fighters arrived the hotel was s seething mass of flames and it was impossible to do anything. Because of the great fire hazard fire trails have been constructed on the side of the mountain to assist in fighting fires and these are expected to prevent the flames reaching any of the summer homes or communicating to Muir Woods in the valley below, where are located several fine specimens of giant Redwoods. The Tavern was built in 1898 and was valued at approx. $50,000. 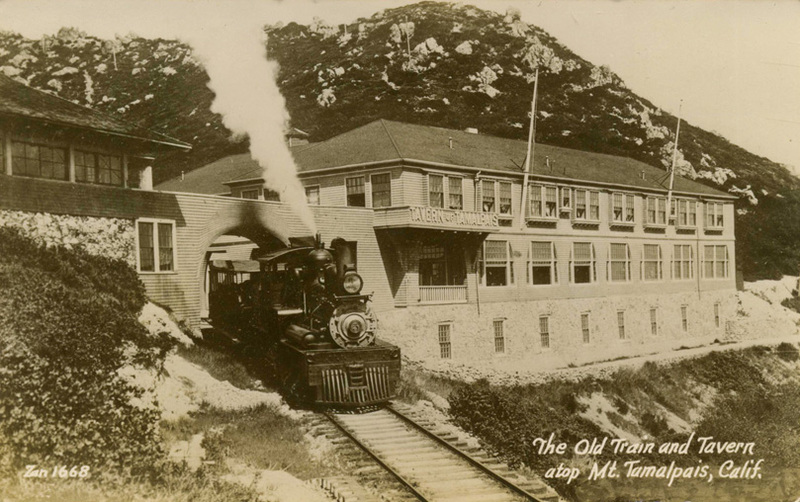 It had 35 rooms, a large lobby, and served as a station for the Mount Tamalpais and Muir Woods Railway Company which operated the mountain resort. 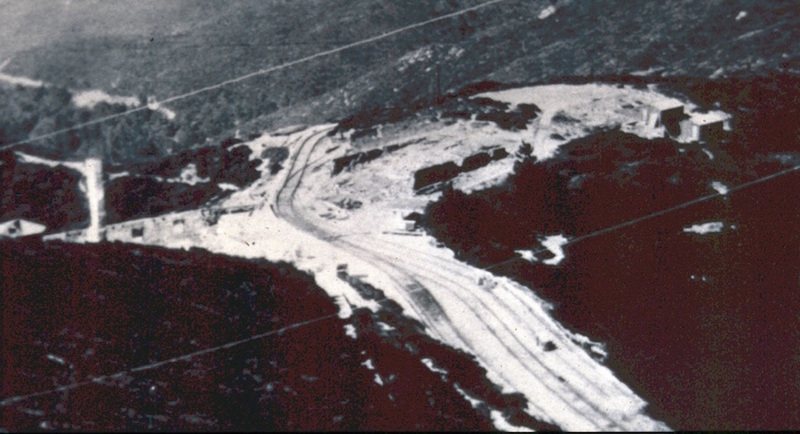 The Tavern was built during the Spanish American War by Ralston White Jr., who has a home on the side of the mountain. 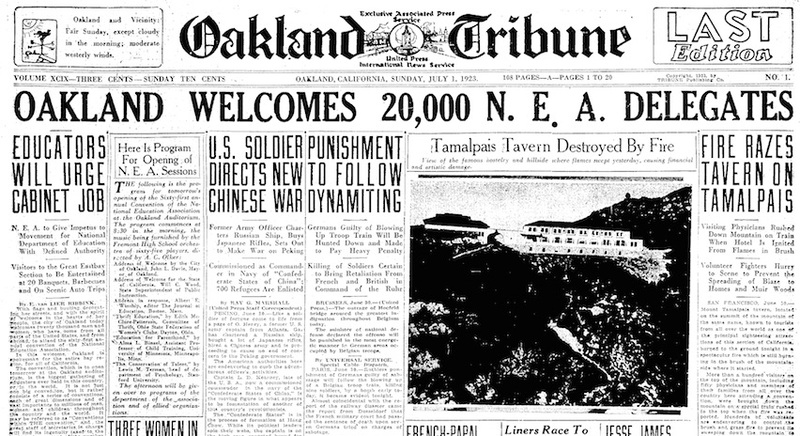 It was during the same period that the Mount Tamalpais and Muir Woods railway was completed. The Tavern is owned by former Congressman William Kent, who is also chief stockholder in the railroad. The Tavern won its greatest fame in 1915 when a Congressional junket party of about 250 persons visited the place. 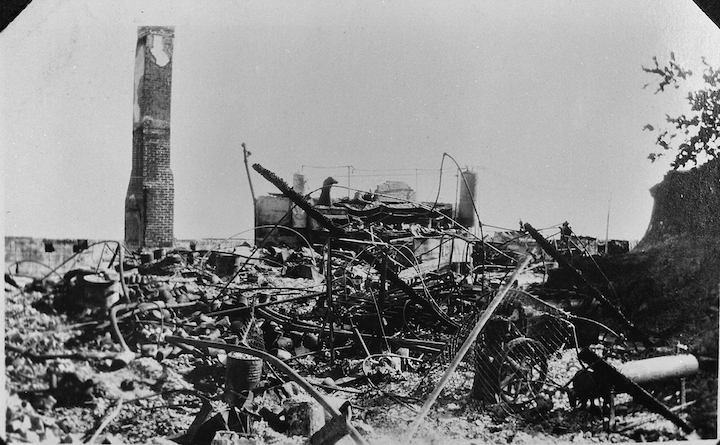 Among the visitors were Franklin Roosevelt, former Secretary of the Navy; Thomas R. Marshall, former Vice-President of the United States, and “Uncle Joe” Cannon. F.C. Whitmore, general passenger agent for the Tamalpais and Muir Woods railway announced last night that service on the road will be in operation today on the regular schedule. Tourists will be taken to the mountain top and given lunch at Muir Woods Inn instead of the Tavern. According to Whitmore the loss at the Tavern aggregates to $75,000." Photo looking down on fire site from the top of the mountain, courtesy of Captain Pete Martin, retired Marin County FD. Additional from Senior Captain Greg Jennings, Marin County FD retired - "Post fire photo showing some small construction shacks on the site of the managers house."